Learner drivers generally fall into two groups: students taking their first foray into independence; and young professionals who never really saw the point of a car until their jobs required them. Either way, most of the people who are learning to drive are working around a pre-existing schedule, whether that is school, college or work. As a result, their driving lessons tend to take place at the same time every day – early in the morning, late afternoon or in the evening. While this may be an unavoidable fact of life, it is also not the most realistic start to your life on the road. 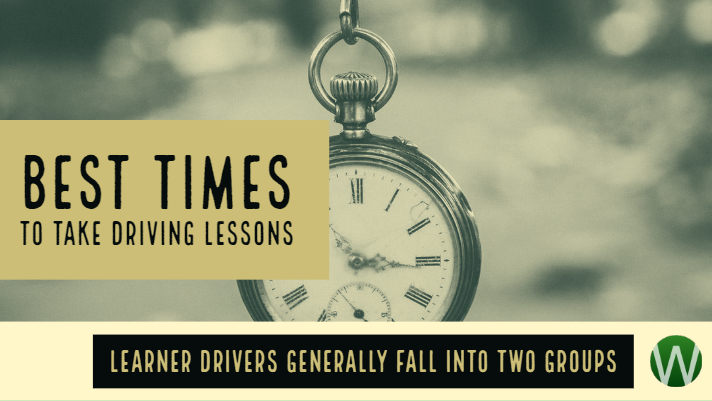 Over the course of one day, driving conditions can vary wildly – from the early morning calm, to the rush hour commute, to steady daytime traffic, rush hour again, and then night-time driving, which can be a daunting prospect for even seasoned drivers. Before getting your license, you should try to experience as many of these driving conditions as possible, to prepare you for life as a driver. Speak to your instructor and try to arrange lessons at a variety of driving times. Maybe you can spare a lunch break once a week, or schedule your lesson for later in the evening. Most instructors work during the weekends, so choose a time slot for a Saturday or a Sunday. For instance, if you find that most of your lessons coincide with the afternoon rush hour, ask your instructor for a lesson on a Saturday or Sunday morning when the roads are a bit quieter. The scariest thing about driving is other cars. If you can use your lessons to get as much experience as possible in different driving conditions, you will be a much more confident driver after you pass your test.